The purpose of the E001 is to monitor and control a large number (hundreds) of lights distributed over a wide territory. For implementing of the system, the whole territory should be divided into several regions each of which should have its own monitoring and control centre. Dividing the territory into the regions should be done not arbitrarily but having in mind the regions around of the existing service centres, where the servicing people are located. For the monitoring and control of the lights there will be Monitoring and Control Centres (Regional Centres) consisting of a computer, telecommunication modems and, of communication, monitoring and control software and databases. 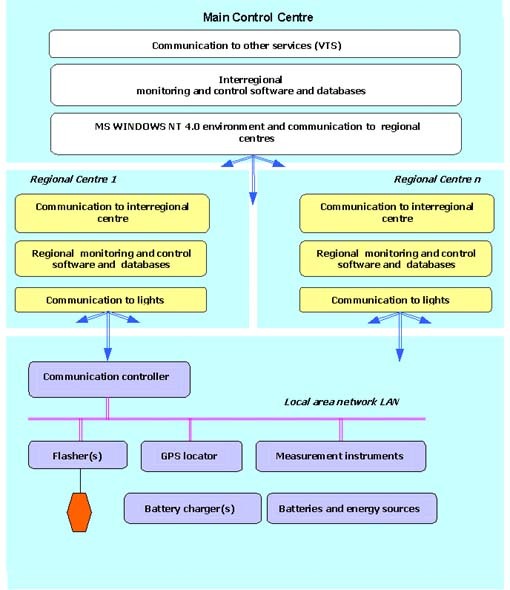 All lights of a region will be connected with the corresponding Regional Centre via communication channels.